President Ram Baran Yadav of Nepal. 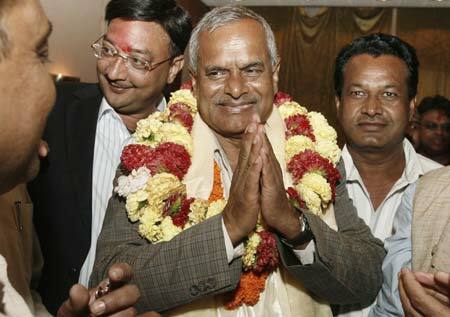 Dr. Ram Baran Yadav of the Nepali Congress made history on Monday by becoming the first president of the new republic, defeating the Maoists' candidate in a runoff election. Yadav was also backed by the third largest party, the Communist Party of Nepal-Unified Marxist Leninist (UML), and by the Madhesi Janadhikar Forum (MJF). In Saturday's election, the MJF's Parmanand Jha was elected vice president. But the presidential candidates failed to win the required majority, leading to the runoff on Monday. Supported by the centrist Nepali Congress (NC) party, Yadav won 308 out of 590 votes cast in Nepal's Constituent Assembly in a runoff with Maoist-backed rival Ramraja Prasad Singh. With Yadav's victory, the former Maoist rebels have failed to have the candidate they were supporting elected as the first president. Yadav is a doctor-turned-politician who received his MBBS degree from Kolkata and his MD from PGIMER, Chandigarh, spending about 11 years studying in India. After practicing medicine for eight years, Yadav joined the Nepali Congress following the 1980 referendum on whether to choose a party-less Panchayat (council) system or a multiparty system. After the election for first president of Nepal, the alliance between the NC, the UML and the MJF has put a big question mark on the constitution making process and will bear a negative impact on the entire peace process in the future. As far as the election of the president is concerned, the NC, the UML and the MJF reached an alliance that has put the agreements, including the 12 points agreements, at stake. The selection of a president has been seen as a vital step to ending a weeks-long political impasse after the assembly ousted unpopular King Gyanendra and abolished the 240-year-old monarchy in May. But the result showed other parties in the assembly ganging up against the Maoists, who won the largest single block of seats in elections to the new assembly earlier this year but not an outright majority. If the Maoists succeed in forming an administration, they may find themselves with little chance of implementing key platform pledges like land reform and will face constant risk of being toppled by rivals. The Maoists' continued involvement in mainstream politics is seen as crucial to the survival of Nepal's peace process, which ended a decade of civil war that left at least 13,000 dead and crippled the already impoverished country. The political game staged during mid '90s has been repeated again at a time when the people are waiting for progressive steps in the country's development. Meanwhile the former rebel CPN-Maoist has decided not to join the government. A meeting of the Maoist central Secretariat committee held on Monday had decided to refrain from joining the government after its candidate Ram Raja Prasad Singh did not win the presidency. Maoists will stay out of the government. The decision taken by the Maoist central committee will not be changed, a Maoist leader said. Pushpa Kamal Dahal, the Maoist party chief, said, "The unnatural and unholy alliance between the NC, UML and the MJF has put a big question mark on the constitution making process and will bear negative impact on the entire peace process in the future."